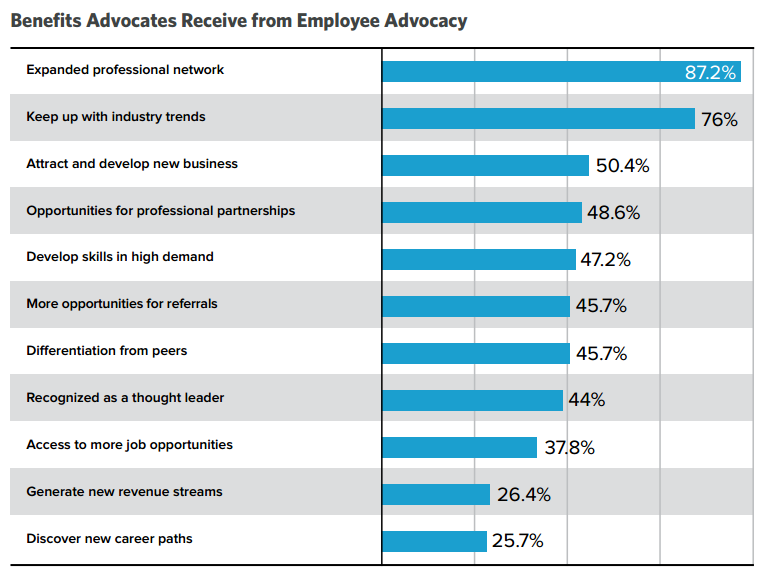 Employee advocacy is growing fast. 7 out of 10 companies are currently considering, testing, or already have employee advocacy programs. There’s a reason so many see value in such programs. 79% see increased visibility, 65% get better brand recognition, 44.9% grain increased web traffic, and 33.7% receive improved brand loyalty, just to name a few reasons. While the benefits for brands are clear, many see numerous challenges when rolling out and getting employees to adopt programs within their organization. 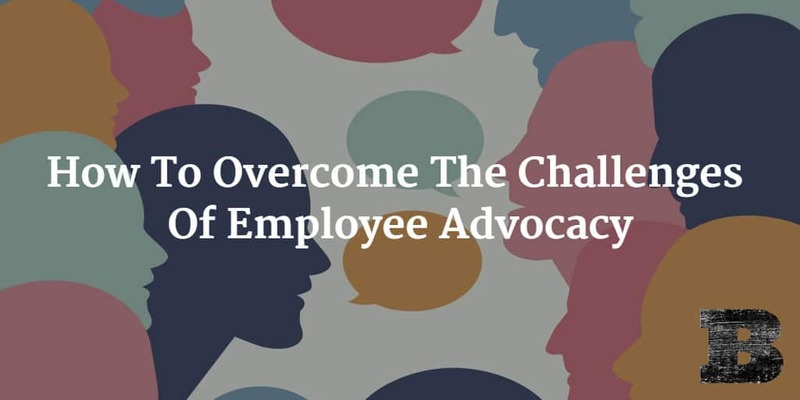 Here’s how they can overcome the biggest challenges of creating a successful employee advocacy program. The biggest challenge of employee advocacy programs isn’t the planning, distribution, or measurement, it’s helping employees see why it matters to them. Instead, we must show employees the benefits they receive from employee advocacy. Here’s a look at what employees get from the deal, based on survey results from a recent Hinge Research Institute and Social Media Today survey of professionals (mostly B2B) who use social media for business purposes. So many companies focus on why employee advocacy is important to the company, without ever considering the benefits employees receive. As with any task, there’s a cost-benefit analysis that happens in the mind of your employees when asked to do it. If they don’t see any personal benefit to the task they’re being asked to perform, they’re unlikely to keep doing it, especially with all of the other tasks they have on their plate, which do have clear benefits. Just like marketing to your customers, selling employees on advocacy is about showing the benefits to them, rather than simply stating what it does. Here’s how advocating benefits them, rather than here’s what advocacy does for the company. By showing employees the benefits they’ll see, you create a personal connection to the task of advocating. This will create advocates that have a personally vested interest. Showing employees what’s in it for them is the first step in creating inspired employee advocates. To continue motivating employees beyond the benefits they receive, there are a number of motivations that can help. 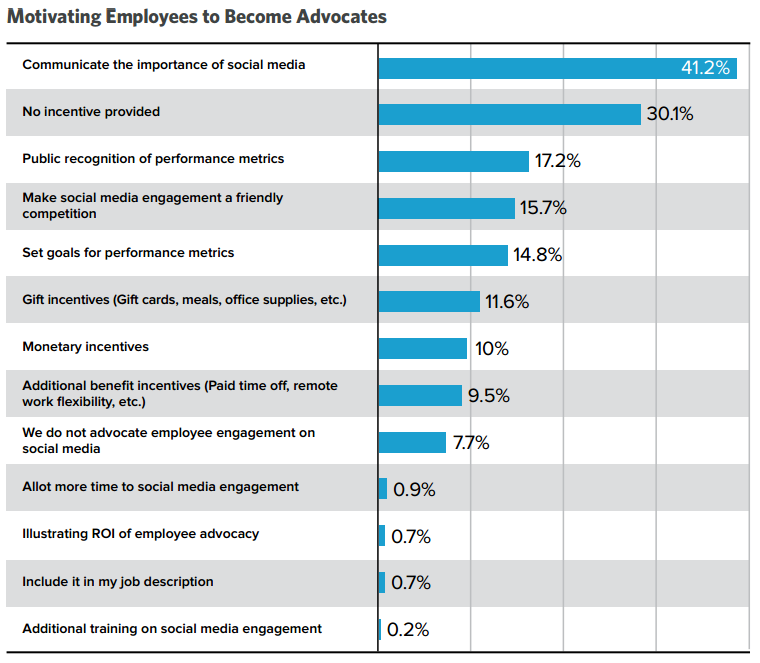 The Hinge Research Institute and Social Media Today survey also found many ways to motivate your advocates. Showing employees the importance of social media is key to motivating them to become employee advocates. Again, don’t focus on how it benefits the company, but rather on how it benefits them. Surprisingly, we see that over a third of respondents don’t have any incentives to become advocates. If we show them the other benefits to advocating (such as expanded professional networks, keeping up with industry trends, or developing skills in high demand), there isn’t a need to provide incentives outside of the personal benefits. By motivating employees and continuing to focus on why they should support your efforts, we can create far more engaged employees that are happy to help support your efforts. Now that you’ve created engaged employee advocates, it’s time to give them all the tools they need. You may have things like social sharing and distribution tools in place but your employees will benefit too when given the right tools. Training is key to getting the most from your employee advocates. Here are the place that employees most identified as opportunities for more training. It’s not just social media sharing. 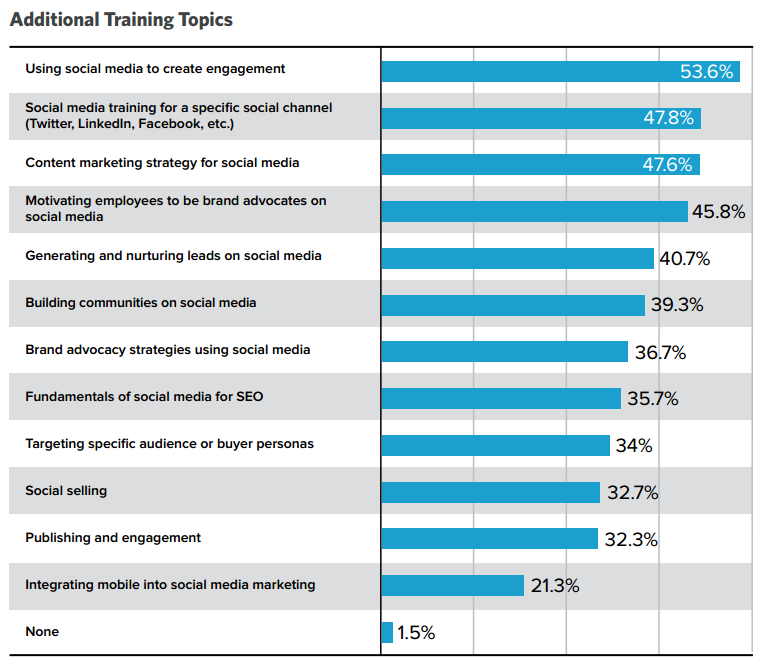 Using social to create engagement is the most commonly identified area to train. Creating engagement on social is something many companies struggle with in their own social media marketing, so finding a way to create truly engaging content can be a challenge. It’s worth investing in, for both your brand and employee advocates. All social networks aren’t the same. We recognize that each has it’s own nuances. Each has differences in audiences, messaging, and the type of content that works. Share that knowledge with those that are helping you promote, so that they can better understand how they can produce the best response. Most of the training opportunities identified are around social media education. Remember that while marketers may know social, others in your organization don’t. They’ll need to be trained at all levels of social media understanding. By providing training to employees, we can create a group of employee advocates that produce the best results possible. It’s certainly worth the investment. Building a successful employee advocacy program is easy, once you find the right way to inspire and motivate employees to take part. Those that tell employees that they should share because it’s good for the company and will benefit the business quickly see enthusiasm decline. Companies that focus on showing employees the direct benefits they receive from advocating are far more likely to see continued enthusiasm and far greater success. Put a focus on what’s in it for employees, motivate them, and provide them with the training they need for success. By approaching your program from what employees receive, rather than what the company gets, you’ll be on track to build an employee advocacy program that’s sure to succeed. Go inspire success.